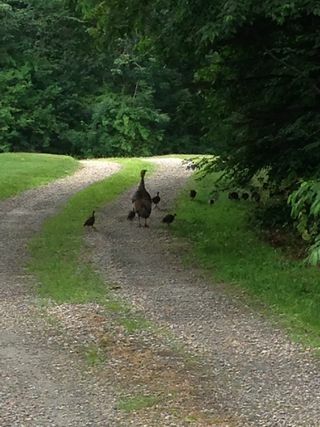 Another day in Litchfield County with a Mama turkey and her chicks enjoying our driveway! What to call them? Male turkeys are called toms, female turkeys are called hens, baby turkeys are called poults and a group of turkeys is called a flock. What do they look like? Turkeys have interesting features that stand out upon first glance. One of the first things people notice about turkeys are the red, fleshy stretches of skin and bulbous growths located around the head and neck region. How do they see us? A turkey's eyes are located on opposite sides of its head. The position of the eyes allows the animal to see two objects at once, but limits its depth perception. Turkeys have a wide field of vision and by moving their neck, they can gain a 360-degree field of view. How do they hear us? Turkeys do not have external ear structures such as tissue flaps or canals to assist with hearing. They have small holes in their head located behind the eyes. Turkeys have a keen sense of hearing and can pinpoint sounds from as far as a mile away.